American Pharoah, a 3-year-old bay colt, won the 140th running of the Preakness Stakes to move one step closer to Triple Crown history. BALTIMORE — Racing arrives again and ever long past due, at the cusp of history, in a familiar place with a familiar narrative. A racehorse has again won the first two legs of the Triple Crown and again the broader world beyond its tidy borders will put aside other avocations for a few minutes, three weeks from now on the first Saturday in June, and watch to see if, at long last, one of the most famous droughts in sports will be brought to a merciful end. We have been here before and before and before and the story is as recognizable as our reflections in the morning mirror. We no longer trust it, but we surely know what it looks like. Yet there was little else about what transpired late Saturday afternoon at crumbling Pimlico Race Course that was commonplace or mundane. When it was finished, Dortmund and Firing Line, who had battled American Pharoah to the finish in the Derby, were fourth and seventh, beaten by 15½ and 46 lengths, respectively, margins that showcased Pharoah’s dominance and talent. “American Pharoah is special,” said Hall of Fame trainer D. Wayne Lukas, whose Mr. Z finished a soundly beaten fifth after chasing American Pharoah early in the race. “I think this could be the year.” (Of course, we have heard that before). And when it was finished, some familiar facts bubbled straight to the surface. Eleven horses have won the Triple Crown, but none since Affirmed in 1978. Thirteen have won the Derby and the Preakness and 12 failed in New York (In 2012, I’ll Have Another was scratched on the eve of the Belmont). It is a stubborn streak that disproportionately haunts the sport. Not long after the race, Pimlico public relations staffers distributed a list of horses who did not run in the Preakness, but who might take a shot at spoiling the Triple Crown in the June 6 Belmont Stakes. Among them are three trained by Eclipse Award-winning trainer Todd Pletcher, including Derby sixth-place finisher Materiality, who many experts felt would be a Preakness threat but whom Pletcher opted not to enter. The presence of multiple fresh horses preparing to ambush American Pharoah in New York ensures that media and fans will revisit the post-race comments made by California Chrome minority owner Steve Coburn after Chrome was beaten by Tonalist—who skipped the first two legs of the Triple Crown—in last year’s Belmont. Coburn called accused Tonalists’s connections of taking “the coward’s way out,” and his comments got considerable run. He should expect his cell phone to ring often in the next three weeks. But before of all of that, before the stretch run and before jockey Victor Espinoza (who also rode California Chrome) raised his whip in the air (he hit Pharoah with it 32 times in the Derby, but not at all in the Preakness), before Pharoah’s entourage dragged themselves across a muddy racetrack to a giddy, rain-soaked and televised trophy presentation in the infield, there was a half-hour of prelude that was as surreal as any that you will ever see at a racetrack. Baffert walked behind Pharoah past the grandstand toward the small, indoor saddling paddock. Fans shouted at him and chanted his name. A few booed. Baffert recalled that in 1997, when he made the same walk with his young son, Forest, one fan had held up a sign that read, NOT TODAY, BOB. “My son got really upset,” said Baffert. At 5:52, just as Pharoah, Baffert and Bode turned into the indoor paddock, it began to sprinkle. Pharoah took at least two dozen turns around the ring, more than any of the other seven starters. Baffert walked outside across the dirt track to the Pimlico turf course and legged Espinoza up onto Pharoah, a Preakness tradition. It had already been a trying day at the decaying track known as Old Hilltop. Much of Pimlico’s water supply had been choked off midafternoon (track officials said that this had been caused by a water pipe break two miles from the track). Humidity had been rising throughout the day, soaking a record crowd of 131,680 spectators, many of them partying on the infield. At 6:08 p.m., just as the post parade began, the skies unleashed a violent thunderstorm. Sheets of rain blew sideways across the track and lightning illuminated the sky. This action forced Pharoah to run a quick first quarter, 22.90 seconds. But then he slowed to 23.59 for the second quarter, preserving his energy. Handicappers had thought that jockey Gary Stevens on Derby runner-up Firing Line, would pressure American Pharoah from the outside (reversing their Derby roles). But Firing Line stumbled out of the gate. “That was our race,” said Stevens. 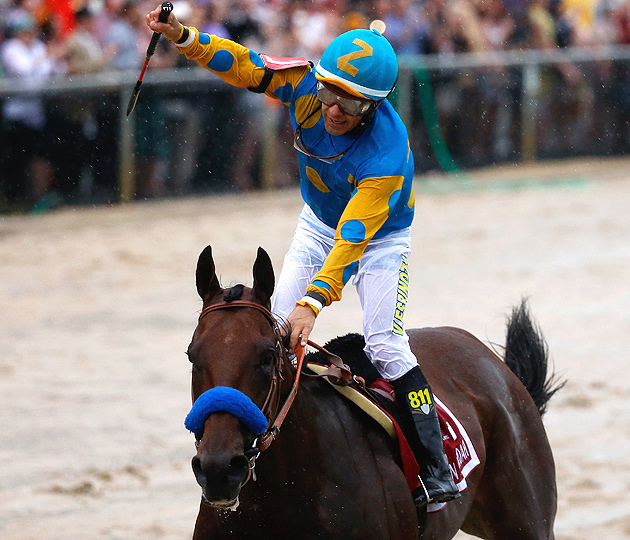 American Pharoah was the only horse in the Preakness field who had previously run on a sloppy track. He clearly relishes it, and galloped along in the lead. Watching the monitor, Baffert said, “He’s gonna run away from those horses." That is exactly what he did, with minimal urging from Espinoza. His winning time of 1:58.46 is slowest Preakness since 1950, but that seems like a statistical outlier. Pharoah had been running fast early. Clearly the track was made slow by the rain. The time seems insignificant.